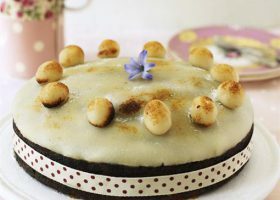 A traditional Easter favourite; this cake is easy to make and tastes great too. Preheat the oven to gas mark 4/180C (170C in a fan oven) Add the butter and sugar to a food mixer bowl and use the beaters to cream together until pale and fluffy. Add the eggs a little at a time, mixing after each addition. Add a tbsp of flour also to stop the mixture from curdling. When all the egg is incorporated, fold the flour in, then add the orange zest and dried fruit and stir so it is all combined. It should be a dropping consistency, if it is too dry add a little orange juice. Spoon half the mixture into the tin, then cut a circle from the ready rolled marzipan to fit on top then spoon in the remainder and level the top using a spatula. Make a small hole in the middle of the cake (this will ensure an even rise). Put in the oven on the middle shelf and bake for 30 minutes then turn the oven down to gas mark 2/150C (140C in a fan oven) and bake for about a further 1- 1 ½ hours (all ovens vary so much) Check to see that the cake isn’t browning too much if so, cover loosely with foil. It should be golden brown. To check if it is cooked, insert a skewer into the centre, if it comes out clean it is done if not cook for a little longer. Leave to cool before releasing from the tin and sit on a wire rack.